Today I was attacked by a shark. My partner and I had spent the morning fishing from our double kayak in the Bay of Islands in the far north of New Zealand. All the fish seemed to have gone on holiday as I had not been getting any bites at all. That was until now. But first, let me tell you about the lead up to the events. It was our last full day, housesitting in the idyllic location. We should have been packing up, but I’d promised my father I’d bring home some fresh snapper, and well… the boat ramp is just across the road. The sea was calm as we headed out, excited by the prospect of what we might catch. ‘Hope we catch a Kahawai,’ I said to Mike. As we paddled past the boats moored in the bay, I noticed one called Amityville. I shrugged it off, refusing to see it as an omen. My shoulder ached so I stopped paddling and let Mike do all the work. I sat back and relaxed, taking in the scenery. We are so lucky to be invited to housesit in this stunning location; fresh fish on our doorstep, kiwi living in the surrounding bush, and of course Buddy, the dog we look after. Mike’s paddle splished and splashed as he propelled us along, serenading me with Just One Cornetto. I scanned the area for a good spot to fish from when something caught my attention. In the channel, a bright orange boat cruised along slowly, as if looking for something. ‘Is that the coast guard?’ I asked. ‘Oh yeah, I forgot about that,’ he said. Two days earlier we were out fishing in the kayak, when a 45ft yacht sailed directly towards us, beating into the wind. I kept a close eye on him, hoping he’d seen us. We were probably sitting in the prime position for him to tack, so I wondered whether we should move out of his way just in case. I mentioned this to Mike, but he was snagged on the rocks and didn’t want to cut his line. Meanwhile the yacht got closer and closer. The brown yacht continued to encroach on our space. An old man on board raced around the bow of the boat, yelling and cursing, trying to take his sails down. I know a little bit about sailing and I’m pretty sure you can’t steer the boat from the front. By this stage the yacht was almost upon us. ‘Okay, cut your line, we need to move. Now!’ Mike continued to ignore me as he tried to de-snag, no sense of the danger. ‘Just a little,’ I yelled back, silently cursing him under my breath. Anyway, that was two days ago. And someone phoned looking for a brown yacht… Hmmm, dead bodies were even more on my mind now. ‘You have an overactive imagination,’ Mike said. It’s true, I do. But I’m an author, it’s my job. We bobbed around a while longer, but weren’t getting any bites. I picked up my oar and paddled closer to the yellow buoy where we’ve had success catching fish in the past. I put my line back in and waited. We have a system. I catch a fish and Mike hauls it into the net, then does all the gory stuff behind me. I slowly reeled it in, being careful as I didn’t want to lose him. I could tell it was a snapper by his tell-tale bites and the way he tugged at the end of the line. Okay, I had no idea, but all we ever catch are snapper, so it was an educated guess. As the fish neared the surface, I turned my rod back towards the net to make it easier for Mike to scoop it in. What happened next was totally unexpected. ‘Holy f**k,’ I screamed as a huge shark appeared beneath the kayak. Immediately I turfed my rod and reel into the sea as far as I could. The shark’s tail came into the kayak and whacked me, before disappearing after my rod. I wasn’t mucking around. I grabbed my oar and paddled like my life depended on it. Mike still had his line in the water. ‘Get rid of it, get rid of it,’ I yelled, convinced the shark was going to take his bait. ‘Like f**k,’ I said and paddled faster, keen to get to the safe hard ground, as far away from the huge beast as possible. Mike took his time pulling in his line, leaving me to do all the paddling. By the time he’d reeled it in, we were back at the shore. If anyone in the Bay of Islands catches a 12 foot bronze whaler with a pink rod attached, it’s mine and I’d like it back please. The rod that is, you can keep the shark. 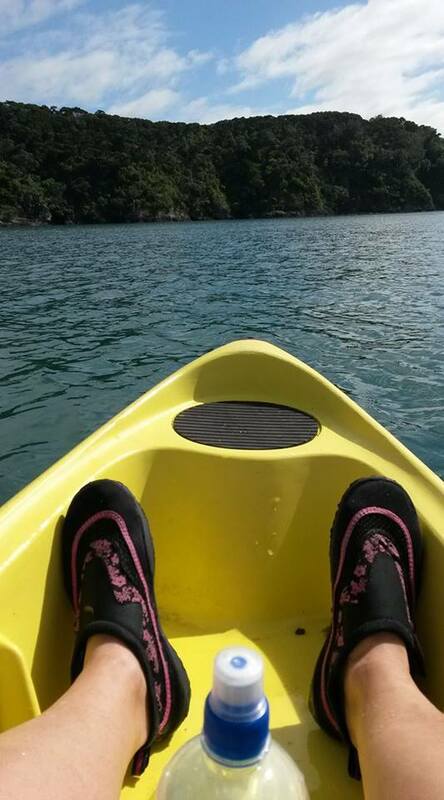 This entry was posted in Blog, HouseSitting and tagged House Sitting, Kayak fishing, New Zealand. Bay of Islands, shark. Bookmark the permalink.